Worst McDonald's product? | WhatPoll? Home > Food & Drink > Worst McDonald's product? As you know, McDonald's is the most successful fast food franchise the world has ever seen. Their star products such as the Big Mac, the Happy Meal, Ronald McDonald, Chicken McNuggets, and their signature fries bring back customers in their millions on a regular basis. Despite this, McDonald's has made a lot of mistakes in launching new products. Fortunately for them, they have the cashflows in place to get over these financial blunders. Which one do you think is the worst idea? Fries and LP Champagne straight to your room. There's a premium on the fries. Some of these, let me re-phrase, ALL of these things look really nasty. What were they thinking! Who the hell wants to eat a pineapple burger? Launched in the early 1990s, the McPizza was a huge failure. First of all, no one associates McDonald's with pizza, so why would people switch from Pizza Hut and their local pizza places? Secondly, most people expect a 3 minute turnaround time for paying for their food and walking out with it. Pizzas take that little bit longer to cook. As a result, McDonald's were left with a lot of expensive new ovens and drive-thru windows that had been widened for the purpose of selling this product. The whole concept of this is just really wrong. Lobster is supposed to be somewhat of a delicacy, not a cheap fast food menu option. I would also like to question what percentage of this $5.99 sandwich actually contains lobster meat? This menu option can still be purchased in parts of New England and Canada, depending upon the season. So if you really can't wait to try it out maybe a road trip is in order? Maybe not. During the 1960s, Ray Kroc (the guy who bought and developed McDonald's from the beginning) noticed that sales would dip on Fridays. The cause of this was found to be Catholics not wanting to consume beef products on this day. In response, Kroc created the "Hula Burger" to compensate. It was the same as a regular cheeseburger, but instead of beef there was slice of pineapple! As you have already guessed, it was a massive failure. 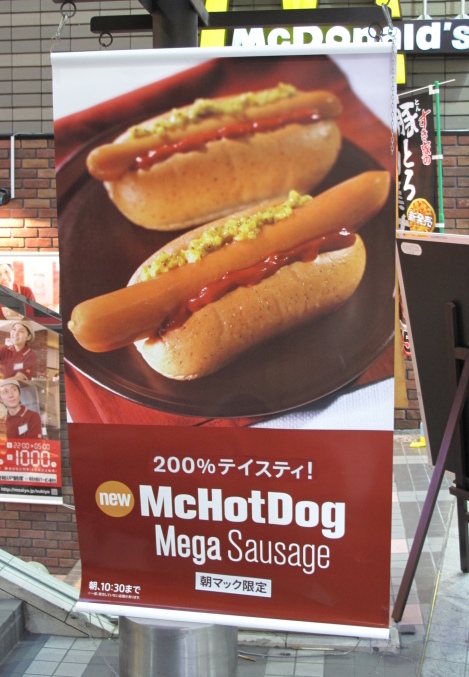 Since the early 1990s McDonald's have tried selling the "McHotdog" in a number of countries around the world. One of the latest examples of these attempts was towards the latter part of 2009 on the breakfast menu in Japan. For whatever reason, they only remain on the menu in each location for a short period of time and never become a permanent product. The McRib is a boneless lump of pork loaded with onions and barbecue sauce. It was first introduced in Nebraska in 1981 and proved very popular, so McDonalds naturally thought it would be a good idea to roll out nationwide. Although no longer a permanent resident on the McDonald's menu, it still appears from time to time on various menus across the world. The first ever McDonald's hotel, the "Golden Arch", opened in Zurich, Switzerland in 2001. As you can see from the accompanying photo, the headboards are designed with their famous logo in mind. The hotel actually received a 4 star rating, which unlike their fast food restaurants, put the accommodation towards the more luxurious end of the market. This leaves the question, why would you fork out the extra money to stay here over the Hilton or Sheraton? Although I never tried this personally, it was allegedly a pretty good tasting sandwich. This however wasn't the problem. The main issue was the fact it was a huge meaty sandwich that was named after a continent where millions of people go starving without food everyday. Many people found this quite "unsavoury". Fortunately it was only a limited edition burger. It formed part of McDonald's celebration of the 2008 Summer Olympic Games. Looking at the below photograph, its not hard to see why the McSpaghetti was a massive failure. People just don't go to McDonald's to eat pasta its a simple as that. In addition to the McSpaghetti, lasagne and fettuccine were also tried and tested in the states of New York and Tennessee. But due to lack of demand and interest, they were shelved. Yup you guessed it, this McDonald's restaurant only sells Quarter Pounders. The regular McDonald's branches did not sell this sandwich in Japan up until 2008, so to introduce it the folks at McDonald's built two restaurants in Tokyo dedicated to it. It was actually a very successful marketing stunt, the restaurants were only open for a couple of weeks and generated a lot of buzz in the media. The McLean Deluxe was McDonald's attempt at combating ongoing criticism that their burgers were far to unhealthy. There solution, the McLean, was a regular beef burger, but with all the fat sucked out, and replaced with a form of seaweed, which was added in order for the burger to keep its shape. Unsurprisingly, it tasted like puke and no one bought it.